This gathering is about peer mentorship. It is an opportunity for you to share with your colleagues something you’re interested in, whether it be to get feedback on a project, practice for an interview, to demonstrate a proficiency you can share with the community e.g. you do killer infographics, workflows or usability reports; discuss how to work with other professional teams, practice presentation skills – you can make it whatever you want it to be! Participation will be highly encouraged, but not required. Our sole purpose for gathering is to support one another in our professional growth. or just curious what this is all about, please join us at the UX Study Group and Peer Mentorship event at BLANKSPACES in DTLA! Be creative and use this time for whatever you need to move forward in your career. Everyone is welcome: designers, user researchers, content strategists, developers, project managers, entrepreneurs and others. Time for individual presentations to the group will be divided based on attendance so please be prepared to be flexible in your presentation time as it will be somewhere between 5 to 10 minutes. After the presentations we’ll have 60 minutes to mingle, collaborate, and connect with the people who most resonated with you, or work a bit on a project and get more feedback before the night ends. Please bring a project, portfolio or even just your resume to practice presenting and getting feedback on. Don’t miss this opportunity, bring business cards and be prepared to make lasting relationships. This lot has an automated exit and accepts both Mastercard and Visa. They usually are open 24-hours. But, be sure to ask before parking there. Weekday evening cost is approximately $7 and subject to change. 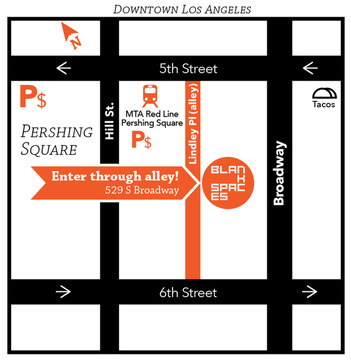 Conveniently located right behind BLANKSPACES DTLA. This lot accepts cash only but sometimes closes at 8PM. So, be sure to ask before parking there. Weekday evening cost is approximately $5 and subject to change. If you cannot make it this time, we hope to see you at the next one! Downtown UX Study Group and Peer Mentorship gatherings will be held monthly in the downtown Los Angeles area, generously sponsored by General Assembly and BLANKSPACES.